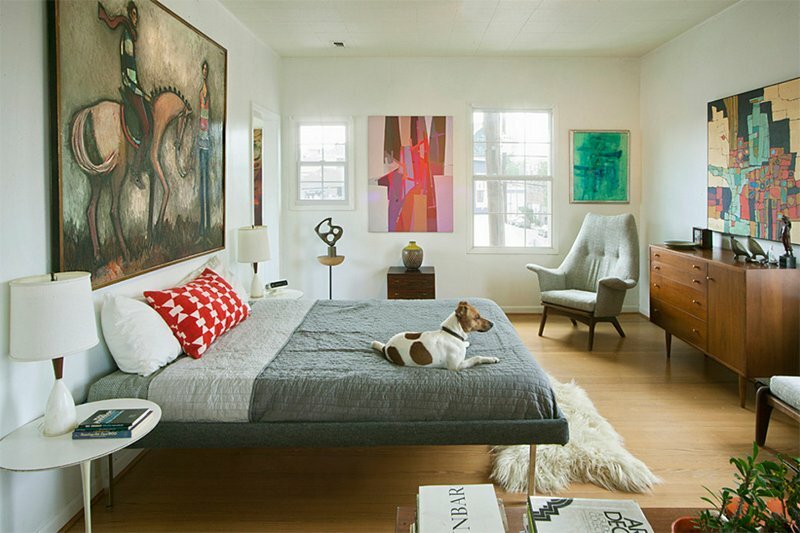 Bright, airy and serene mid-century modern bedrooms to inspire you. No one wants to sleep in a bedroom that is dark and cluttered. That is why, even if it isn’t filled with decors and other creative elements, many homeowners are already happy to have an organized and bright bedroom. Yes, it would indeed be nice to have a bedroom like this one. 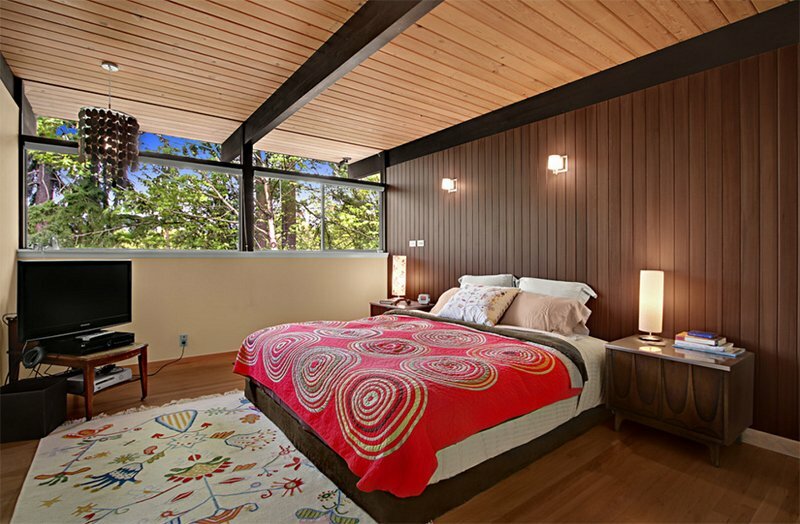 Mid-century modern bedrooms usually have windows around it to allow natural light into the space. 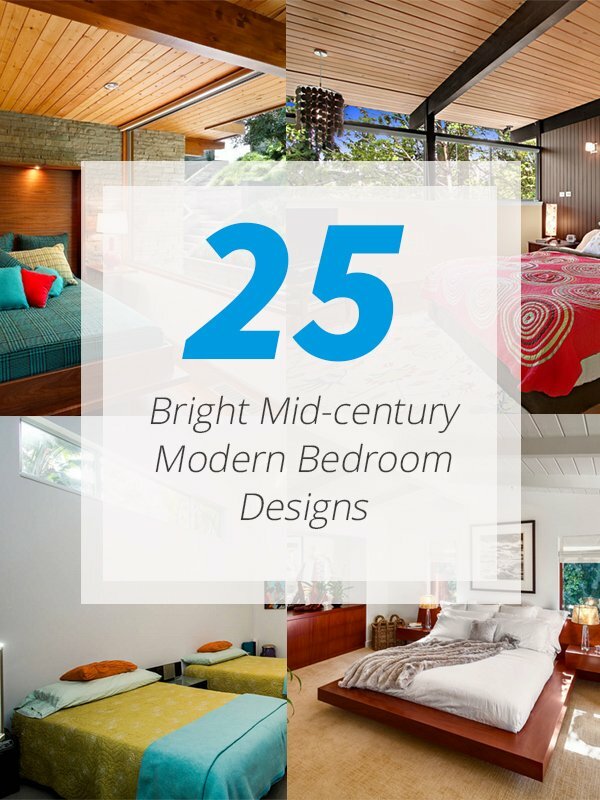 For today, we will showcase a list of mid-century modern bedroom designs. It will give you ideas of how this style looks like and if ever you like it, you can use this round-up as an inspiration your bedroom design. 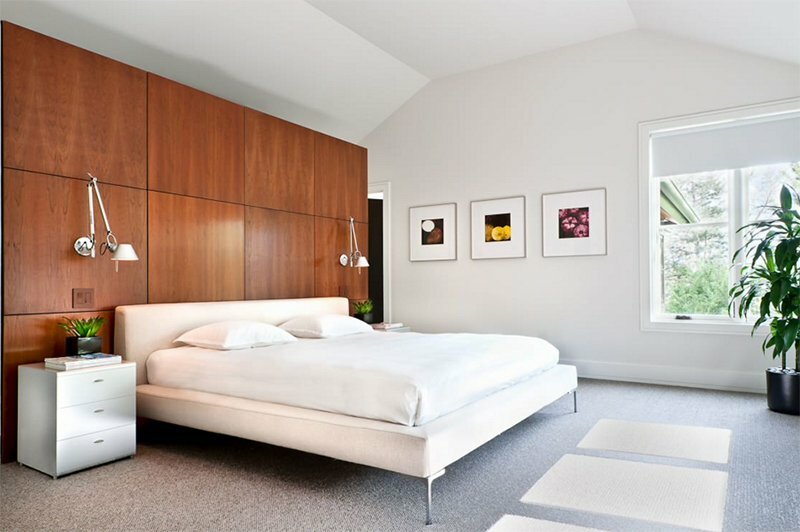 A mid-century modern bedroom isn’t just bright and airy but it is also well-organized and neat. It also combines modern furniture with some natural features and materials. Let us take a look at the bedrooms below. 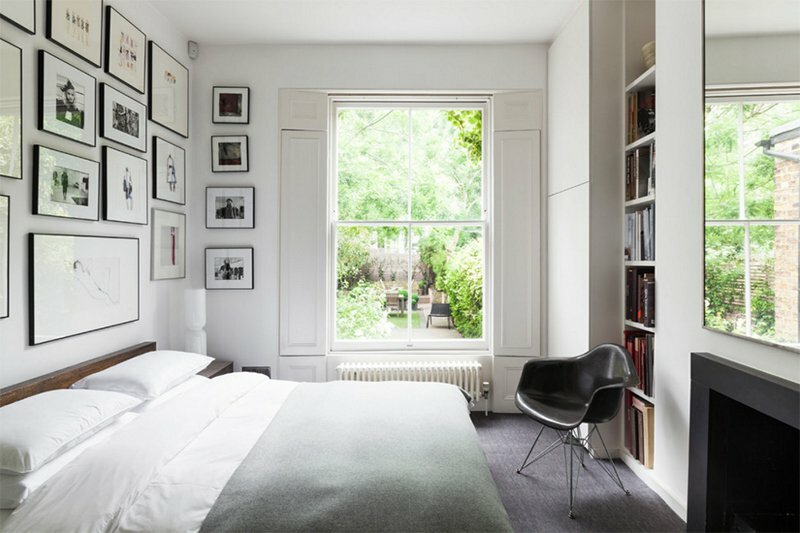 A bedroom with contrasting black and white colors looks even nicer by covering the walls with picture frames that also contains black and white photos. The natural light from the windows bring brightness to the area. This one used earth colors in it that made it look like almost Asian as it exudes a subtle Zen feel. You can notice here that there are different geometric elements from the artworks and decors, even from the pillow. This bring more creative element into the bedroom. 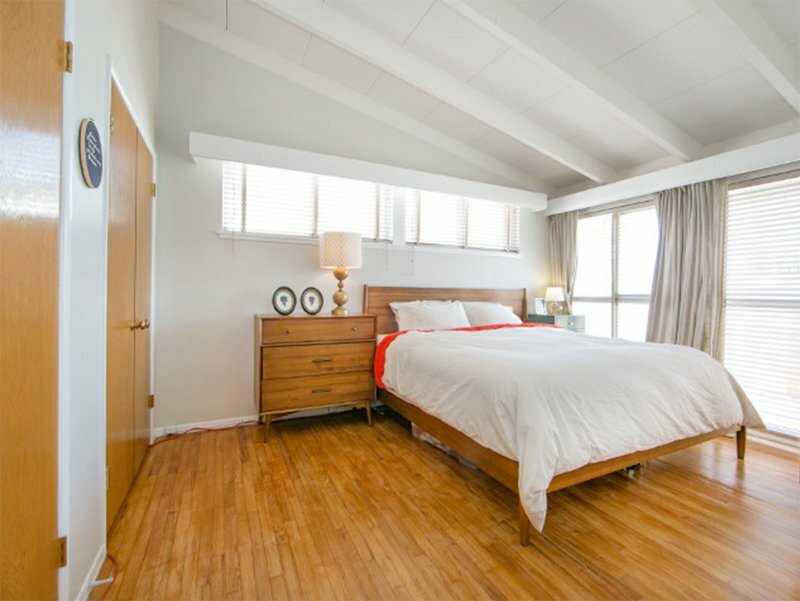 Look at how nice the colors are in this bedroom that is occupied by two people. I can tell that this is the bedroom of the kids because there is a fun element in it. Pops of green and red seems to bring an “apple” impression in the bedroom making it look fresh and sweet. Who wouldn’t love this one? Aside from the wooden ceiling and flooring, it is nice to be able to feel the freshness of the air from outside and get the view of the garden through the glass doors and walls. Such a refreshing space indeed! How about a garden right outside the bedroom? This will not just give you a good view while you are inside but it will also be nice to have a bonding moment with nature everyday. I know we feel the same way about this space. Aside from its relaxing aura with a brush of excitement, it looks really nice because of its colors especially that paisley wallpaper! You would no doubt have a great time while in here because you will surely feel like the oceans are cuddling you for a lullaby every time you go to sleep or take a rest. And the design of the bedroom is very relaxing too. 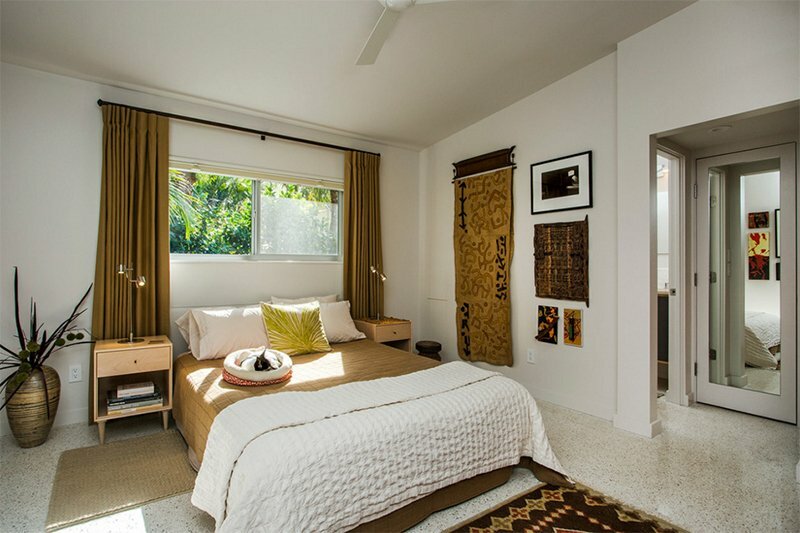 It is nice to see a combination of geometric shapes here for the beddings as well as on the area rugs. This proves that different patterns combined together will definitely work! Aside from the patterns of the bed cover and pillows, you can also see patterns and textures from the brick walls and wooden ceiling. Lovely combination, right? 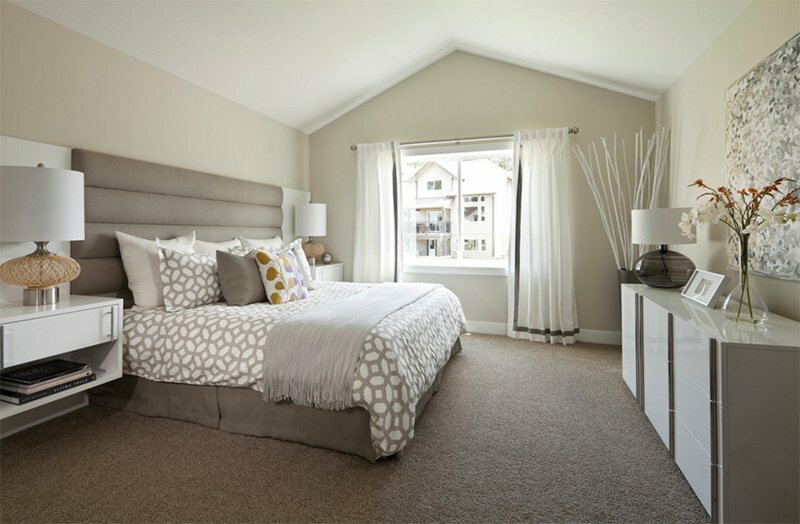 This is a second story master suite where you can see different textures as well as an area rug that adds some colors to the space. Notice that it leads to a deck through sliding glass doors. Love the colors here because it looks really relaxing and serene. It is also good that there are some wooden elements in the area as well. 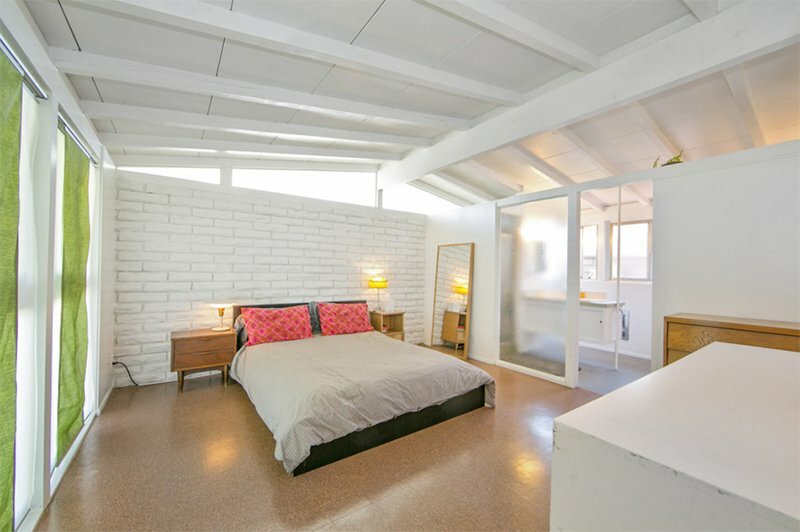 One look at this will already give you a hint that it is a mid-century space because of the furniture used in it and it is also bright because of the windows around it. A nice bedroom that will make you feel relaxed especially because of the added plants here as well as the use of wood. It is also well-lighted and has a good combination of white and wood. 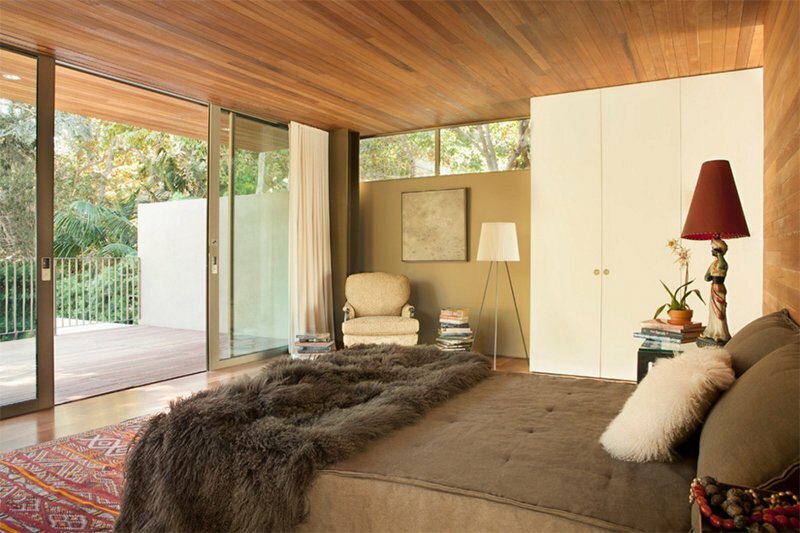 That large window brings in natural light into the bedroom which makes the wooden features look even nicer. 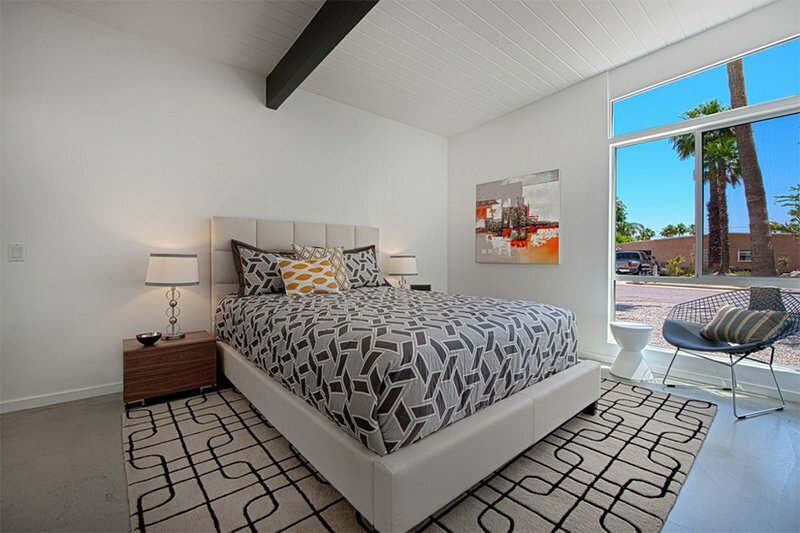 And of course, you can notice the cute wall sconces too that add brightness to the bedroom. Apparently, this one looks really relaxing because of its neutral colors from gray to white. And it has a comfy bed too that features an upholstered headboard. 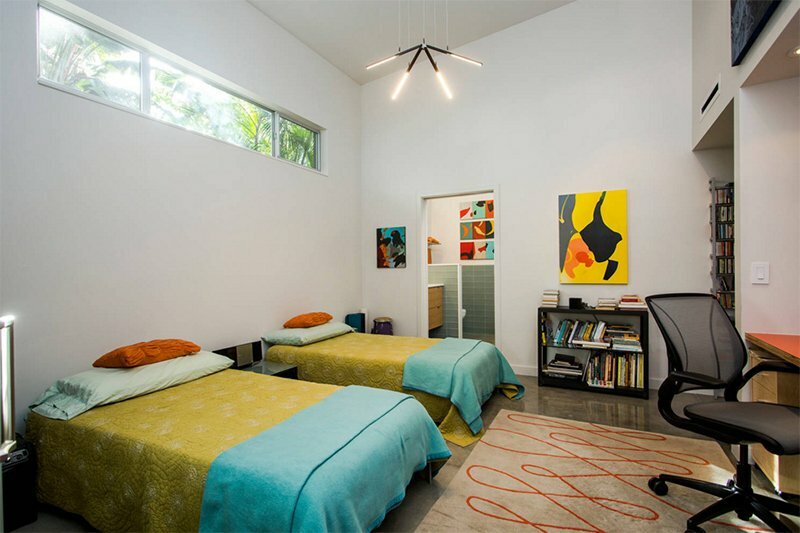 A bright mid-century modern master bedroom that keeps minimal clutter and allows maximum relaxation. Could be a perfect example of simplicity is beauty! That green wall brings an exciting yet refreshing aura to this bedroom. 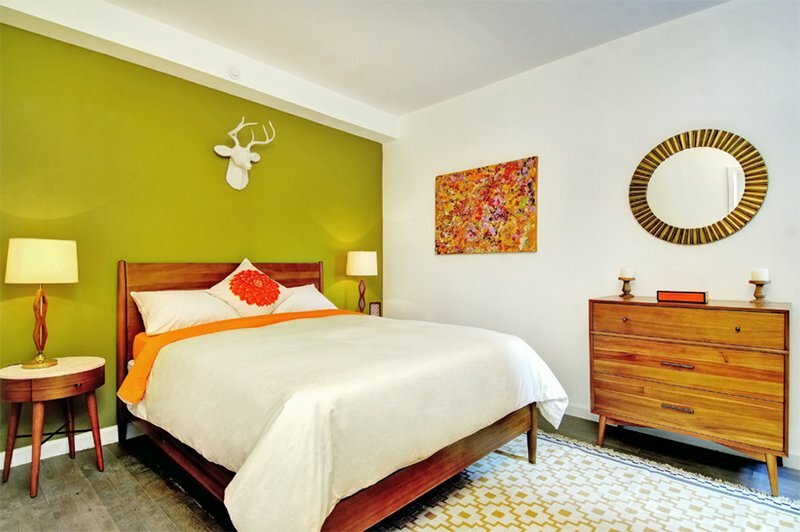 It was a nice idea to add an animal head wall decor in white to that green wall. There are other creative elements too like the area rug and wall decors. 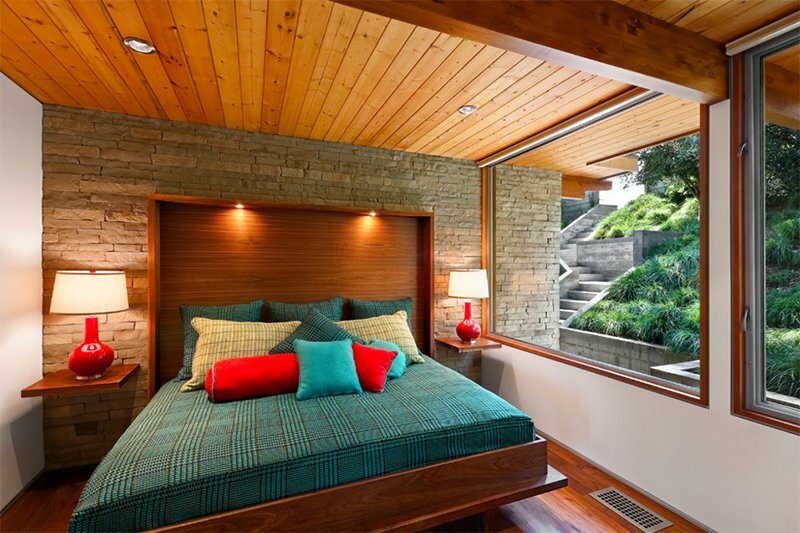 I like it that the bedroom feels natural because of the plants inside it as well as the bricks on the wall. Aside from that, notice that it has glass walls too that will give the homeowner a good view of the outdoor area. 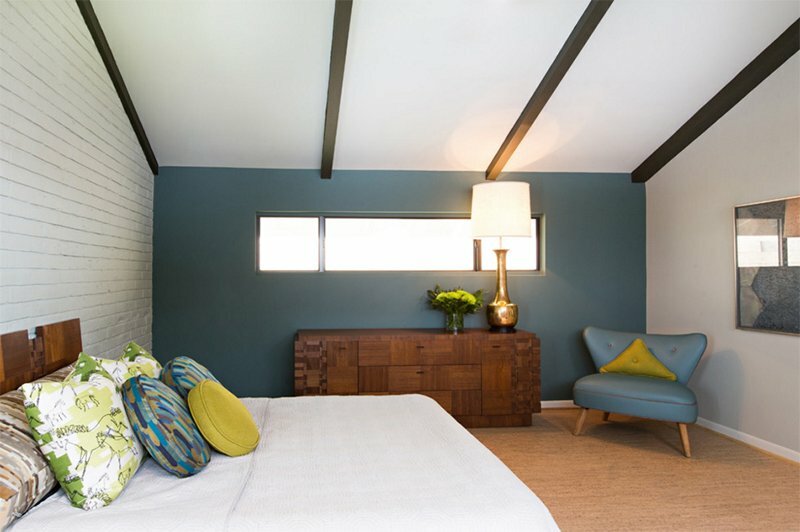 Who said you can’t combine many colors and fun patterns for a mid-century modern space? Of course you can, just look at this amazing duvet set, curtains and area rug! 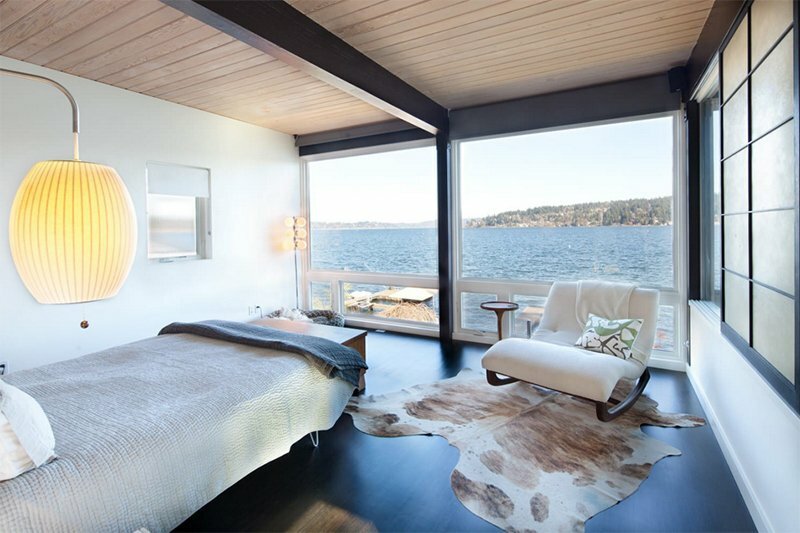 For sure, you will not miss seeing the windows around this bedroom. 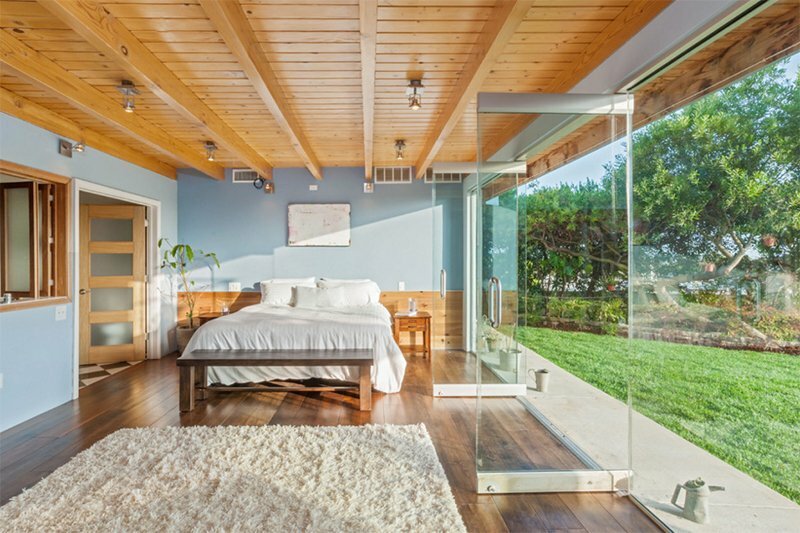 This bedroom has floor-to-ceiling glass and clerestory windows that bring light and height to it. It has a brick wall design too that seemingly adds an industrial element to it. When white and wood is combined, it would always result into a stunning space like this. Just look at that wooden wall panel with wall sconces on it. This could be a simple bedroom with gray walls but the throw pillows of various designs add more appeal to it. And notice that beautiful cabinet and chair too. It would be nice to sleep in a bedroom with a fireplace to keep you warm. That wall decor looks pretty nice too and compliments to the look of the area. So, what can you say? Beautiful, right? 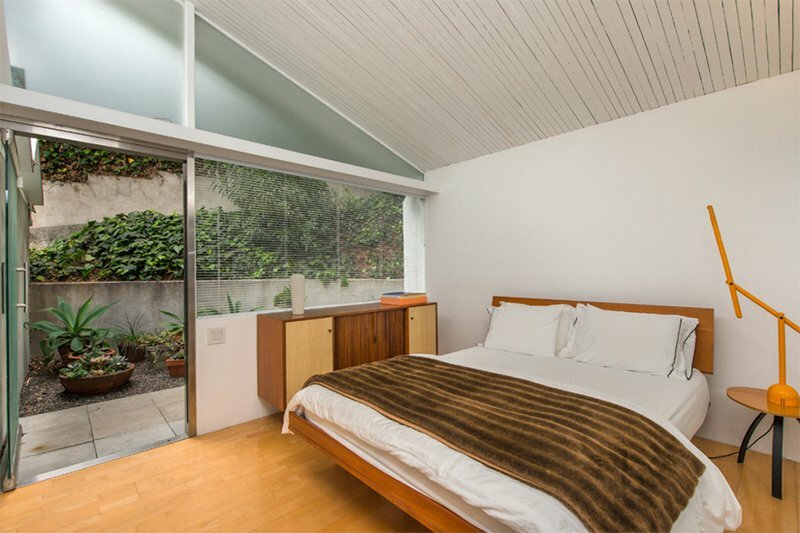 I honestly love the look of mid-century modern. It is like the combination of neat and organized look with a bright and airy feel. It also mixes various elements from natural materials to modern colors. We can see all that in the bedrooms above. And with the looks of it, it appears that you can actually be very creative with your bedroom even with this theme. But of course, you can always try other bedroom styles as well. We have a lot of that and you can always choose the one that suits your personality.